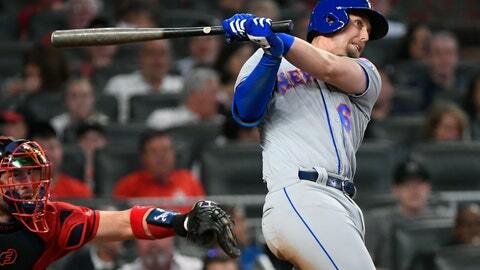 ATLANTA (AP) — Brandon Nimmo didn’t mind getting dropped from first to eighth in the Mets’ batting order. Nimmo couldn’t say for sure if he felt less pressure Friday night against Atlanta, but he managed to capitalize on pitches in the strike zone instead of missing or fouling them off. Nimmo hit a two-run homer, Jeff McNeil added a two-run double and New York kept hitting even without Pete Alonso, beating the Braves 6-2. The Mets have scored at least six runs in six straight games and got there against Atlanta with the rookie Alonso, the team’s hottest hitter, getting most of the night off. The first-place Mets, who have won three straight, scored four times in the fourth inning on McNeil’s hit and RBI doubles from Robinson Cano and Michael Conforto. New York went ahead 2-1 in the second on Nimmo’s second homer. Atlanta took a 1-0 lead in the first on Nick Markakis‘ sacrifice fly. Ronald Acuña Jr.’s RBI double in the fifth made it 6-2. Mets: 3B Todd Frazier was scheduled to play nine innings Friday with Class A St. Lucie and spend more rehab time at shortstop. Frazier played third and first the day before. He is on the injured list with a left oblique strain. … 2B Jed Lowrie, on the injured list with a left knee strain, has been hitting on the field, taking grounders and doing some light running, but he’s still not ready for a rehab assignment. By scoring at least six runs in six straight games, New York tied for the longest such streak in franchise history. Its last six-game run scoring six or more was from Sept. 18-23, 2007. Wright, the No. 5 overall draft pick in 2017, has made seven major league appearances, and the Braves have yet to win a game in which he has pitched. Callaway dropped Nimmo to eighth as he began the night batting .150 with 23 strikeouts, most in the majors, in 38 at-bats. Nimmo went 3 for 4, pushing his average to .205, and scored two runs. He also had a bunt single that helped spark the fourth.